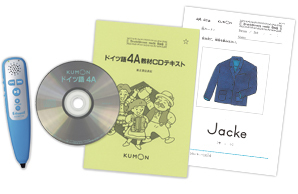 Kumon’s French and German programs were created in 1986 to provide opportunities for children to further widen their knowledge and look at the world with a broad view. A wide range of students from preschoolers to senior citizens in their 80s are now studying with our programs to accomplish their goals through individualized study. The worksheets progress in a series of small steps and include directions written in Japanese, which promote self-learning. Using CDs, students begin by listening to songs and repeating basic words and sentences. They then move on to practicing oral reading while systematically learning the basics of grammar. Through intensive practice of reading and writing, students are able to enrich their vocabulary and develop advanced reading comprehension ability as they go from reading simple passages to different genres of classic literature. Kumon's French worksheets consist of 15 levels, and are designed for students to eventually read the masterpieces of Stendhal, Proust, and other writers in French. 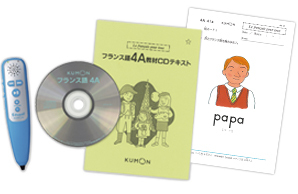 Kumon's German worksheets also consist of 15 levels, and are designed for students to eventually read the masterpieces of Kafka, Thomas Mann, and other writers in German.